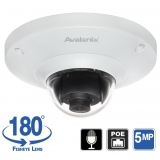 Fisheye security cameras are in available in several varieties. First is the angle of panoramic view; the most popular are 180° and 360° view security cameras that allow coverage of a wide area with one camera. We recommend use of such wide view cameras for short distances as the fisheye view can only provide a maximum of 15ft of facial recognition on recorded video for legally admissible footage in court. Second choice is the signal type. 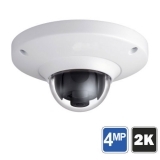 We carry both IP cameras and HD over Coax cameras in fisheye form. Please make your selection using the product filter below, and carefully read each product's description to learn more about compatibility with DVR and NVR. 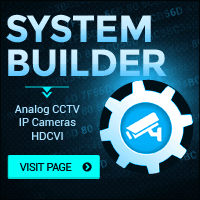 Keep in mind that an IP camera records to an NVR, and a HD over Coax camera records to a DVR. 360° view cameras require specialized NVRs for Fisheye Dewarp.